Samsung believes that Consumer Ultra Low Voltage (CULV) laptops that sit between netbooks and notebooks will enhance their range, but profess that they will have to work hard on explaining it to the public. Consumer Ultra Low Voltage is one of the buzz terms in the mobile computing market at the moment, bringing the longer battery life of netbooks but with less of a performance hit. Samsung is now one of the powerhouses in the UK laptop and netbook market, and Phil Brown – who is the General Manager of mobile computing for the company believes that there is a niche for their X-series. "We're trying to make sure that the netbook has an end to end story from an entry level product right through to the N510 and then CULV will take on another story.
" Netbooks are about viewing content on the move and CULV is for people who want to create content on the move – then the story moves on into notebooks." Brown acknowledged that manufacturers must make it clear exactly what purpose CULV laptops will serve. "We can work with our retailers to make sure that when someone walks into the story there is a journey through what their requirements are and how they are led through the store and our range. "We're working really hard with all of our partners to ensure that we are presented in the right way and the consumer understands our story." 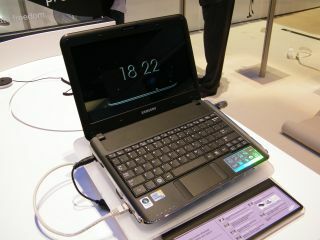 Pricing for the CULV range remains a key point, and Brown points out that it starts where the new premium netbook – the N510 stops. "Our range will start at £499 and then we'll proceed upwards, he said. "That gives you a clear differentiation from where the N510 will stop and CULV will start. "We're really proud of what our CULV range is going to bring to the market – offering something different to consumers."